Now we will be sharing the remainder of our journey in the Marquesas archipelago. On the last day of our boatyard onslaught, our new crew members arrived. To recap the introduction of our crew: Adam is an old friend who was sailing with me back in the days of the 29ft Tabula Raza sloop cutting our teeth in the Channel Islands. 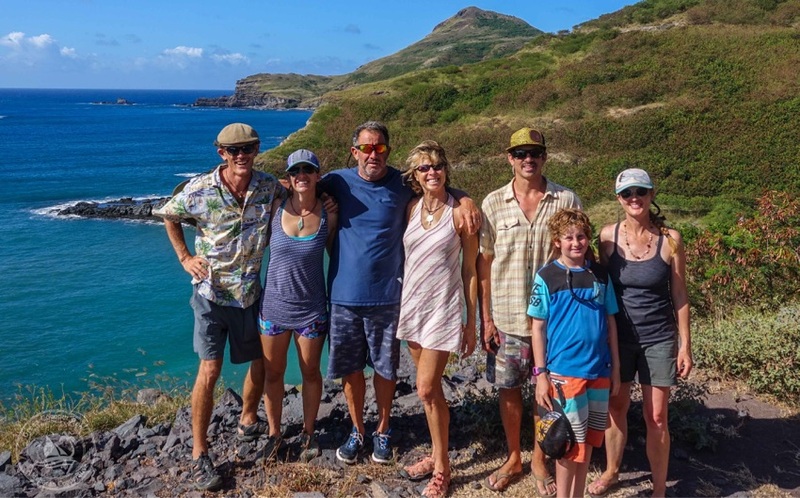 He brought his wife Kendra and son Asher to join us in Costa Rica last year, and now they were sailing with us for two weeks in French Polynesia. Along with them were another couple, Matt & Judy from San Diego, parents of our long time coop member Robby Seid. It was their first time aboard. It was a crowded boat, but we took everyone because as school teachers this was the only time they could visit us: summer vacation. Our route: sailing from Hiva Oa south (12 nautical miles) to Tahuata for a few relaxing days snorkeling; then heading north overnight (65 nautical miles) to the island of Ua Pou, and then finishing with another day sail (25 nautical miles) to the island of Nuku Hiva. Nice! So what lucky island is going to host you for cyclone season, have you decided yet?